In Texas the beloved and common indicator of springtime’s arrival is the Bluebonnet. 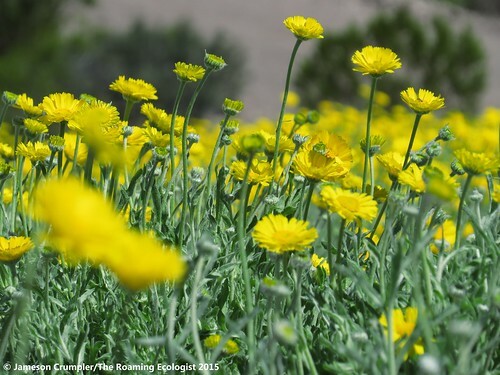 The wildflower is also the hallmark of spring road trips in the state. There are six species of these members of the genus Lupine in the state and all are considered to be the state flower (state law also grants that any new species discovered will be recognized as an official state flower), thus Texas has the distinction of actually having six state flowers. Of those six, there are two endemic species: Sandyland Bluebonnet (L. subcarnosus) and Texas Bluebonnet (L. texensis). The latter is the most widely known. L. texensis is also the most widely cultivated in the state due to the fact that it tolerates a broad range of soil types. L. subcarnosus is intolerant of non-sandy soils, develops chlorosis on limestone sites, and thus is edaphically restricted (Nixon 1964). These limitations prohibit seed increase work of L. subcarnosus at the commercial scale, though a seed dealer in North Texas does offer the species for sale. Even then, L. texensis will remain the preferred Lupine species in the commercial seed market. It is tried and true, well known, easily obtained, less expensive than L. subcarnosus, and is grown at commercial-scale quantities by many seed farms. Four of the six species of Lupine are termed “winter annuals” – they germinate in the fall and overwinter as a rosette, then flower the following spring and into early summer before setting seed and dying. Two species, Perennial Lupine (L. perennis) – found only in Hardin and Jefferson Counties and last collected there by botanists in 1978 (Flora of TX), and Nebraska Lupine (L. plattensis), found in Hartley County in the Panhandle, are perennial. Lupinus havardii in a roadside habitat, where it is more commonly seen today. 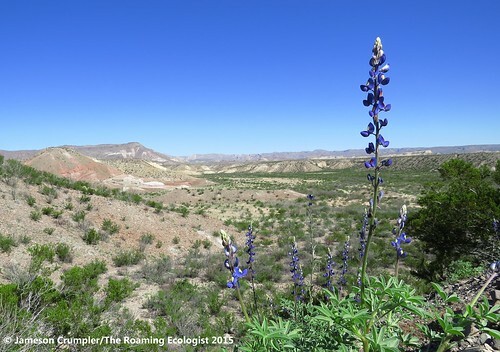 In the rugged Big Bend region of Far West Texas exists the largest and most robust Lupine species in the state. Big Bend Bluebonnet (L. havardii) flowers from January to June and can grow to heights of 4’ on good sites. This species was first collected in 1881 in the vicinity of present day Presidio. Based on my travels, it appears the species is limited to habitats within 20-30 miles of the Rio Grande. Thelypodium texanum in a badland clay ecological site. A wild mustard. 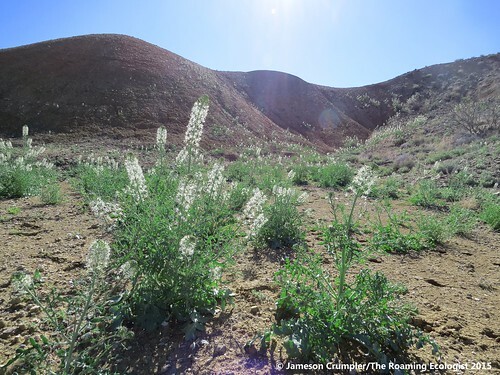 Bentonite mining destroys this plant’s habitat. Other associated wildflowers that can be seen in flower at this time are Texas Thelypody (Thelypodium texanum), an annual of bentonite clay soils, Bladderpods (Lesquerella spp. ), and Desert Marigold (Baileya multiradiata). A profusion of Baileya multiradiata occupying an expansive open site devoid of graminoid competition. This forb can flower nearly year round in the warmer regions of its habitats. Forb and grass species that grow and flower within the same period and, when viewed together in photos, can tell the viewer the season of year without he/she ever having to step out of doors. This is referred to as aspect dominance, or the “adjustment of species to seasonal changes” (Weaver and Clements 1938). There are four types of aspect dominance: “prevernal (early spring), vernal (spring) , aestival (summer), and autumnal (Weaver and Clements 1938). Nixon, E.S. 1964. Edaphic Responses of Lupinus texensis and Lupinus subcarnosus. Ecology 45:459–469. Weaver, John E., and F.E. Clements. 1938. Plant Ecology. New York City, NY, USA: McGraw Hill Book Co. 601p. Tagged bentonite clay, betonite mining, big bend bluebonnet, bluebonnet, desert marigold, spring wildflowers texas, texas bluebonnet, texas thelypody. Nice to see the spring flowers. The temperature here is 7 and we’ve got more snow coning. I love hearing what’s going on in the desert this time of year. Glad to see the post brought you a little virtual warmth, Pat. Take care! Nice post, Jameson. My daughter lives in Katy and is always trying to get me to come down to see the Bluebells. But somebody has to mind the prairie here. Thanks, Mike. The Bluebells are definitely worth leaving the eastern prairie for a few days. ^^that’s interesting – I wonder how many other states have that same clause.